Agriculture is a massive topic.  It encompasses a lot of what Ag Tech is all about. In fact, it is what the first part of our name, ‘Ag’, stands for. We have been teaching on cultivation techniques and crops. Ag Tech has taken on the art of permaculture. Permaculture is the development of agricultural ecosystems intended to be sustainable and self-sufficient. Permaculture uses all aspects and components of a farm to benefit the whole. * We also build and maintain aquaponic systems. Aquaponics is a sustainable, organic food production system that combines traditional aquaculture (fish farming in tanks) with hydroponics (cultivating plants in water) in a symbiotic relationship. Simply put, it takes the by products of fish farming and uses them to fertilize the plants, which in turn, removes toxic elements from the water for the fish. Ag Tech also teaches many forms of gardening including homestead, urban, intercropping, alley cropping, fruit trees and grafting, herbal/medicinal gardening, and soil conservation. For example; traditional farms would create a permanent location for chickens that creates an unhealthy environment for chickens, produces smell and a toxic environment. Permaculture utilizes chickens to fertilize farming land and eat pests by using portable coops or free ranging the chickens. This lessens the need for fertilizers and pesticides.